Samsung is making bold moves with its new lineup of Galaxy S10 smartphones, which were announced Wednesday at its “Unpacked” press event in San Francisco. Following a year of slower sales growth — due largely to the S9 models not being different enough from its successful Galaxy S8 products — the company hopes a handful of innovative features will inspire consumers to trade in existing devices for newer models. Samsung kicked off its event with the debut of the Galaxy Fold, a 4.6 inch-smartphone that can open up into a 7.3-inch tablet. Along with Samsung’s long teased Infinity Flex display, it has a hinge to make the transition more seamless. The luxury device, which will cost $1,980, hits stores on April 26. 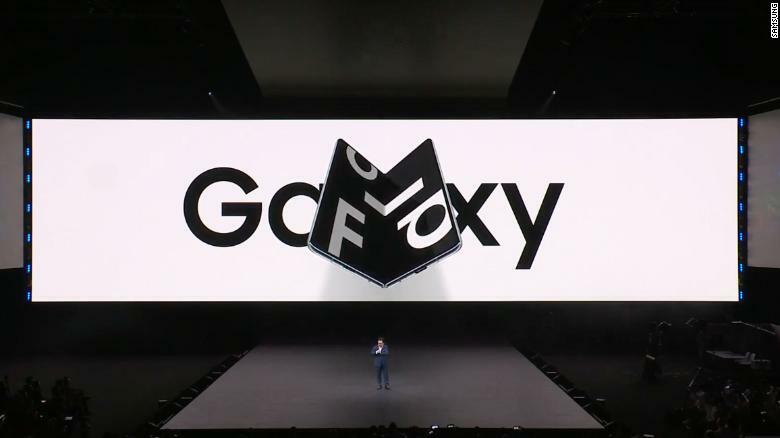 The Galaxy Fold, which will be available in black, silver, green and blue, supports three apps at one time: You can watch Netflix, Google something and answer text messages at the same time. Consumers who flock to big screens, whether for gaming or the ability to see more of their data in one place, may be attracted to the unique concept. Samsung has already proven that there’s interest around larger-screen smartphones with the success of its Galaxy Note line. But Samsung will need to convince developers to design apps for the unique form factor, and consumer demand out of the gate might not be enough to encourage this considering the price point. Samsung is back with updated versions of its best selling Galaxy S smartphone, too. Its next-generation flagship device comes in four options: the 5.8-inch S10e ($749); the 6.1-inch Galaxy S10 ($899); the 6.4-inch S10+ ($999); and the 6.4-inch S10 5G (pricing has yet to be announced). The Galaxy S10, S10+ and S10 5G devices feature a new curved, quad HD+ AMOLED display, which the company says whips up crisper and more vibrant colors and reduces blue light exposure to help reduce eye strain. (The lower-end S10e touts a full HD+ flat screen). The three higher-end models reverse Samsung’s unpopular decision to put the fingerprint scanner on the back of the device last year. Now built into the display itself, the “ultrasonic fingerprint reader” compliments its Face Unlock feature but promises more security. It doesn’t just take pictures of your fingerprint; the company says it uses machine-learning-based algorithm to read 3D fingerprints through ultrasonic sound waves. (Fingerprint data is stored only on the device itself, according to Samsung). The S10e features a capacitive fingerprint sensor on the side of the phone instead. Not surprisingly, Samsung is upping its camera game. The winner for the most cameras goes to the Galaxy S10 5G, which offers a total of six, including a dual-front camera with a 3D-depth lens to handle things like augmented reality. It has a quadruple rear camera with a wide, telephoto and (another) 3D depth lens. The S10 and S10+ feature nearly the same without the 3D depth lens on the back. However, the S10e has single front and dual rear cameras in wide and ultra-wide lens. Samsung said the cameras’ software on all the new phones is able to faster identify what’s in the shot and make suggestions for better framing. The four models, which are available for pre-order on Thursday and hit starts on March 8, start at 128GB and go up in cost depending on storage size. The devices come in four colors in the US: black, white, blue and a pink inspired by the Pantone color of the year (Living Coral). More colors will be available globally. The S10 5G model is the first mainstream device to run on lightning-fast 5G wireless networks later this year. The move could give Samsung a significant head start in early 5G markets, such as part of the US, South Korea and China, and pit itself as an innovation leader. Apple isn’t expected to have a 5G iPhone until the final quarter of 2020. Of course, the 5G network is still in its infancy, which could limit the new device’s true potential. But as carriers start to deploy 5G at scale, smartphone manufacturers will start to have 5G as a base specification, rather than an additional special variant of their 4G phones, Stanton added. The 5G model, which is quite large at 6.4 inches due to what Samsung calls a combination of design reasons, will launch on the major carriers in the second quarter and first be exclusive to Verizon. “Although volume expectations will be relatively limited initially, having a foothold at the beginning of 5G deployment will be important to Samsung’s brand and being part of the 5G journey with the carriers, so it can learn as much as possible about this new technology and make continuous improvements with iterative devices,” Ben Wood, director of research at market data firm CCS Insights. The new S10 phones learn your habits. For example, it’ll know you often open a weather app and access Spotify in the morning, and pre-load those apps in the background to save you on load time. (It’ll close them when you’re done so it doesn’t drain battery power, too). Samsung says this small touch will extend the battery life to about 24 hours on one charge — and you’ll have so much power remaining, you can share it with friends. Perhaps that’s the neatest new feature of the entire lineup: the ability to charge another smartphone by placing it on top of any S10 device. It will make wish you knew someone — anyone! — with one of these smartphones when you’re at 2% battery life and looking for a boost. An S10 owner must approve sharing battery life with someone else — so you can’t sneakily leave your phone on top of a stranger’s device at a bar — and it’ll automatically stop when the host smartphone drops below a 30% charge. An S10 will even charge iPhones and other non-Samsung models — a generous feature that’s hard to imagine Apple ever rolling out. The company also announced wireless Samsung Galaxy buds ($128) that can be charged when placed on top of a Galaxy 10S display. (Consumers who pre-order any of the smartphones will get the buds for free). Considering what most smartphone users want is a better camera and longer-battery life, the updated Galaxy S line appears to check those boxes and more. Although it’s unclear how the S10 5G will sell, experts argue it’s a necessary step toward the future.